HEAVY & DURABLE CONSTRUCTION - Each flared rectangular window box is hand-crafted. Thick iron is welded into a sturdy, scrolled frame and finished with a classic black, powder-coated, protective finish. 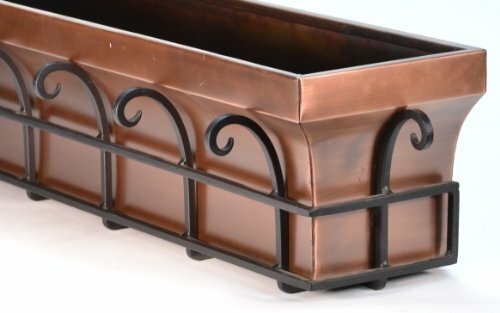 The planting liner is stainless steel with an antique copper finish. The organic texture of stainless steel naturally resists rust and corrosion. Mounting brackets are included. Drainage holes in liner provide excellent drainage. OUTDOOR WINDOW BOX PLANTER - Liner is 30 inches long by 8 inches tall by 8 inches wide, this large size window planter will make a dramatic statement wherever it's placed. Unique and sturdy, it's flat on the back side to sit flush against the mounting surface. If you're looking for something different, this is a window box your neighbors will envy. Thinking minimalistic, fill your H Potter window box with succulent plants or flowers in pots or urns to create simplistic curb appeal. SECURELY PACKAGED AND BUILT TO LAST - A decorative way to display your favorite blooms outdoors, the flared 30 inch window box planter will add a natural warmth to your outdoor décor. It has a wide mouth top, which lets the plants breathe and grow properly. Sturdy yet lightweight - brackets make removal easy for planting and care for everyone from gardeners to landscapers to designers.